INDIANAPOLIS—Indiana health officials are encouraging Hoosiers to protect themselves from tick bites while outdoors as warmer temperatures bring an increase in tick activity across the state. Recent field sampling by the Indiana State Department of Health (ISDH) has found adult and immature ticks (nymphs) carrying the bacterium that causes Lyme disease in a number of counties, particularly in the northern, west central, and south central parts of the state. Maps displaying the tick infection data are available at https://www.in.gov/isdh/28130.htm. 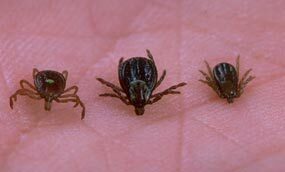 Ticks can transmit several diseases in addition to Lyme disease, such as ehrlichiosis and spotted fever rickettsioses like Rocky Mountain spotted fever. Preventing tick bites can protect Hoosiers from all tick-borne illnesses, Brown said. Once indoors, people should thoroughly check for ticks on clothing, gear, pets and skin. Tumbling clothes in the dryer on high heat for 30 minutes will kill ticks, and showering can help remove any unattached ticks. Ticks may be safely removed by using tweezers to grasp the tick close to the skin and then pulling outward with steady and even pressure. After the tick is removed, the area should be washed thoroughly with soap and water. The tick should be discarded by submerging it in alcohol, placing it in a sealed bag or container, wrapping it tightly in tape or flushing it down the toilet. Ticks should never be crushed with the fingernails. Anyone who becomes ill after finding an attached tick should see a medical provider immediately and alert the provider to the exposure. Tick-borne diseases can be treated with antibiotics, and prompt diagnosis can help prevent complications. For more information about ticks and how to prevent the diseases they carry, see the ISDH website athttp://www.in.gov/isdh/20491.htm. You also can visit ISDH atwww.Statehealth.in.gov for important health and safety information or follow them on Twitter at @StateHealthIN and on Facebook at www.facebook.com/isdh1.